>This is our coverage of the City of Hull. The county of Humberside was formed in 1974 to cover areas on both sides of the Humber. On the Yorkshire side this included the County Borough of Kingston upon Hull, Beverley Borough, Bridlington Borough, Goole Borough, Hedon Borough, Driffield Urban District, Haltemprice Urban District, Hornsea Urban District, Withernsea Urban District, Beverley Rural District, Driffield Rural District, Goole Rural District, Holderness Rural District, Howden Rural District, and Pocklington Rural District. The principal districts on the Lincolnshire side were the County Borough of Grimsby, Cleethorpes Borough and Scunthorpe Borough. The county was divided into 9 districts, 5 of them on the Yorkshire side: these were Beverley, Boothferry, Holderness, Kingston upon Hull, and North Wolds (later renamed East Yorkshire). In 1996 Humberside was abolished as a county and the Yorkshire or 'North Humberside' part was divided into two unitary authorities, East Riding of Yorkshire, and Kingston upon Hull. Maps in the City of Kingston upon Hull are listed here. 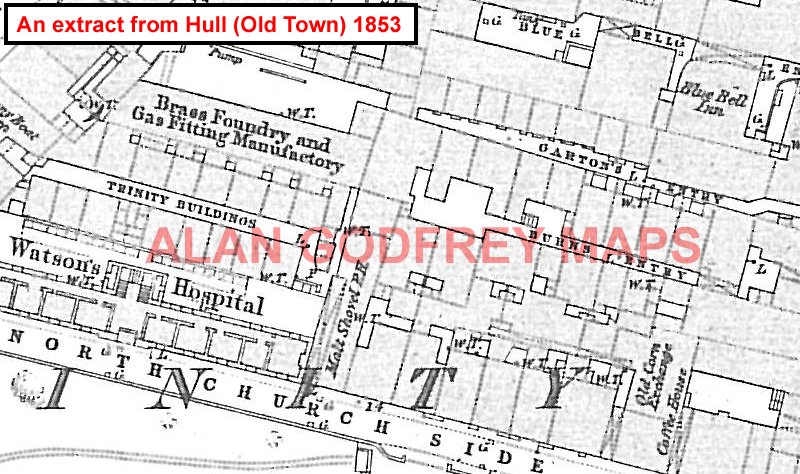 We have also published some very early large scale plans, showing parts of Hull in even greater detail. These are taken from the 'Five foot' plans and reduced to a scale of a Yard to the Mile. A sample extract is given here.